I am hoping this was a Varied Thrush, but it could have been an oriole of some kind. I only got a very quick sighting... it was medium-sized (maybe robin-sized or larger) with lots of patterning that seemed black/orange/yellow. 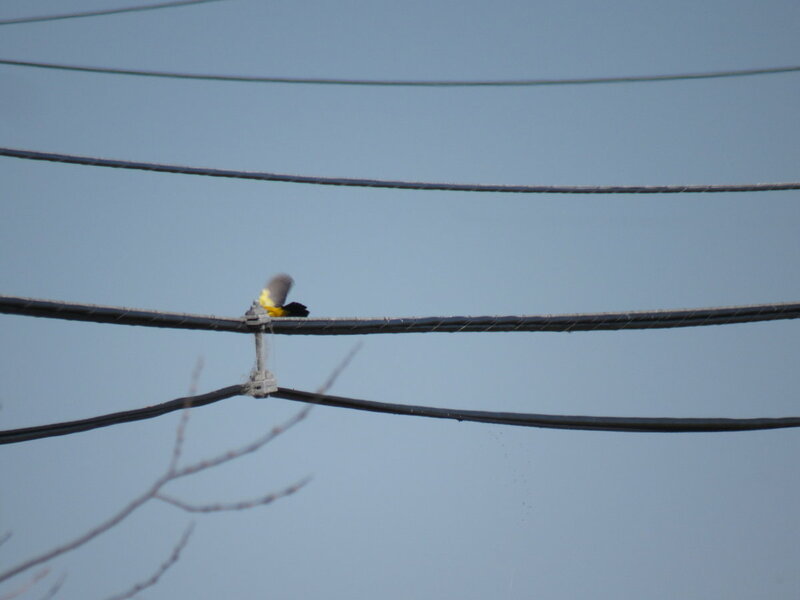 It flew from one wire to another really quickly then disappeared from view. March - Palo Alto CA, habitat was creekside with open fields and some trees near the marshy edge of the bay. I realize this may not be enough to go off of but it's the only photo I got. Thanks! Maybe a Kingbird of some sort? Could be, but i think the colors/patterns were extremely dramatic and it seemed a bit too big (definitely oriole-sized) but I have very little experience with Kingbirds. My sense was that they would be a bit daintier & paler in color than the bird I saw above. Thank you though! Edit: the patterns were clear blocks and lines of color, not in a gradient or shading as far as I could tell.